80 joint personnel conducted raid operation on Jalan Basuki Rahmat, Jatinegara, East Jakarta, Monday (7/9). 98 vehicles who ignored traffic rules and conducted illegal parking have been netted.
" It is also done to anticipate mugging, illegal levy, and other crimes"
This operation is participated by East Jakarta Transportation Sub-dept. (Sudinhub), East Jakarta Traffic police, POM AU, POM AD, and POM AL. 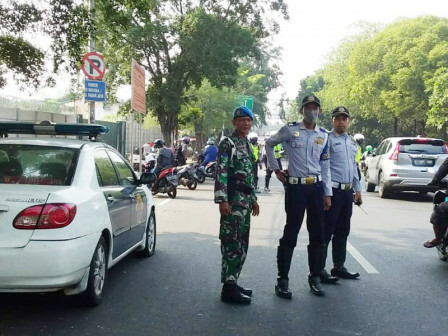 East Jakarta Sudinhub's Supervision and Control Section Head, Slamet Dahlan said, his side once again targeted Gembrong Market for this operation because many illegally parked vehicles on sidewalk and roadside. Not only illegal parking, but many public minivans were also illegally stopping on roadside. "We control Gembrong market since there are many illegal parking in the area. It is also done to anticipate mugging, illegal levy, and other crimes," he explained. According to him, his side has netted 98 vehicles. 50 vehicles were ticketed by police, 40 vehicles were ticketed by Sudinhub, and 8 others were stopped operating and grounded since it doesn't have complete vehicle licenses.